THURROCK Harriers athletes have been representing Essex at competitions around the country. The English Schools East Anglian Region Combined Events competition was held in Boston Lincolnshire on 23rd & 24th June. 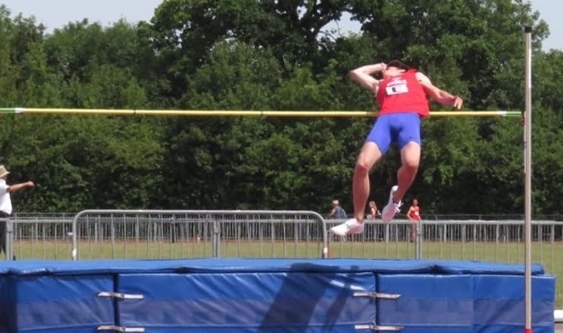 Liam Chivers, Palmer’s Sixth Form (SM), in his first decathlon gained 5PBs in; 100m, LJ, Shot, Discus & Pole Vault. Theo Adesina (William Edwards) U17M came first the Octathlon with a PB of 4856 points. The U17W competition saw, in their first Heptathlon, Ruby Bridger (Hathaway Academy) come third overall with pbs in Shot, LJ and 80mH and Sola Taiwo (William Edwards) gain PBs in 80mH and 800m. Hannah Bardo (Plume) gained a Hep PH and SB in HJ & 800m. Tilly Monk (U15G) in the Pentathlon gained pbs in Pent, HJ & Hurdles. Liam, Theo, Ruby and Tilly have been selected to represent their Essex teams in the English Schools Combined Events Championships in September. In Chelmsford the Senior 8 Counties Inter County Match were held on Sunday (25th). Regan Cuthbert (SM) came first with an impressive pb in High Jump of 1.93m at the Jessica Whitbread also in her Essex red vest came 4th with a jump of 5.15m. Elsewhere Eddie Essex completed the Swansea Half Marathon on 24th June 2018; the 13.1 mile distance was run on a fast and flat course. With the weather a scorcher Eddie managed to finish in a time of 1hr and 52 minutes.